Without Any Additional Work, Give Buyers an Easier, Faster Way To Pay While Increasing Your Profits by Raising Conversion Rates! What is DUvisioPay? 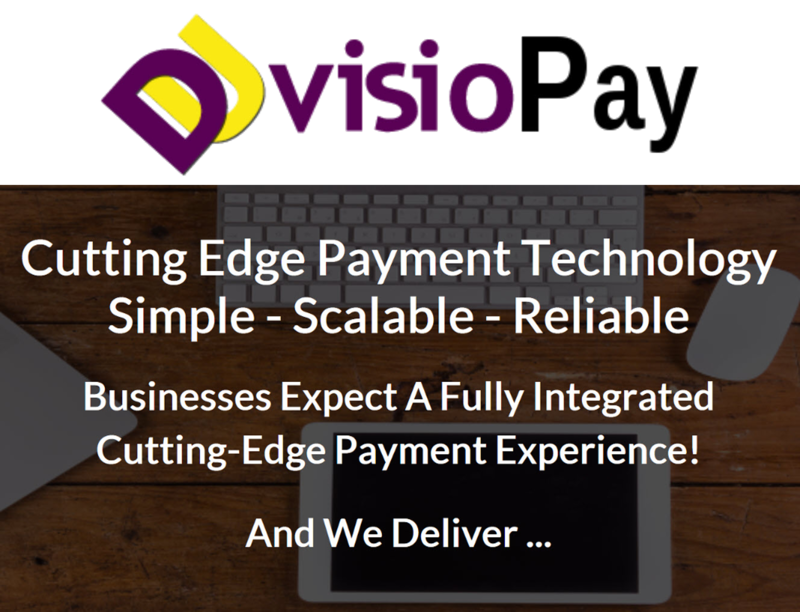 - DUvisioPay is a Payment Gateway Service that understands the challenges of doing business online and offline and processes all major credit and debit card networks. Automated Recurring Billing - Subscription payments are automated, so you don't have to send invoices or statements requesting additional payments. The credit card is automatically billed. Direct Deposits - Because DUvisioPay is a real merchant account the money you collect through credit cards is deposited directly into your bank account daily. DUvisioPay offers Split Pay - Split Pay will automatically pay partners, affiliates, JV partners and brokers up to 7 different receivers on each sale. This is a way to insure other people who are suppose to profit from each sale receive their share. DUvisioPay has low processing fees - The only fee you pay is 2.85% + 30 cents of the sale price charged. This is lower than other merchant accounts and does not require any up front fee like other merchant accounts. Easy to complete application - Not only is the application easy to complete but if your business is in the United States or Canada it is usually approved almost instantly. Businesses outside the United States and Canada may take a little longer. PCI Compliant - All credit card data is protected in a PCI compliant environment. "What Can DUvisioPay Do For You?" It is FREE to apply for a DUvisioPay merchant account. No application fee! DUvisioPay will automatically pay vendors, affiliates, partners and brokers. So you are always guaranteed to receive the money you have earned. Your earned money is deposited directly into your bank account daily. DUvisioPay has a very easy application to complete and if you are from the USA or Canada your approval will almost be instantainious. If you are from an other country approval will take more time. Process credit cards without using PayPal. You can automatically pay more people per sale than when using PayPal. You can use 1 click upsells with DUvisioPay to make more sales. DUvisioPay has embedded payments so customers can pay without leaving your site, which has shown to increase conversion rates by as much as 23%. DUvisioPay is a real merchant account and you can take all major credit cards. You can take credit cards over the phone by using DUvisioPay's Virtual Terminal. DUvisioPay has much lower fees compared to the fees you pay for PayPal plus DUvisio. DUvisio has a real eCommerce cart available for vendors who need one. In the event of a refund the money is pulled back from everyone who received a portion of the sale so the vendor can make the full refund without losing any money. As an affiliate you are always guaranteed to be paid your commissions. It is not the vendor that is paying you but DUvisioPay is paying you. You are applying to DUvisioPay with the same application as a vendor and if you deside to upgrade to vendor so you can sell your own product you will already be set to accept credit cards through DUvisioPay. All affiliates should upgrade to DUvisioPay so you will be able to promote products of vendors who are using DUvisioPay to process credit cards. What If You Could Embed The Complete Payment Process On Your Sales Letters And Still Pay Partners And Affiliates Instantly? The simplified design speeds buyers through the payment process without leaving your website's sales page for a secure and seamless checkout. On Macs, PCs, Cell Phones and just about any device the in-context checkout window keeps the merchant sales page in view while providing customers with a streamlined and tightly-integrated checkout experience. Improve Sales: DUvisioPay Embedded Payments can increase sales by 14% on average and has conversion rates that are 23% higher than standard checkout at some of today's largest online retailers. 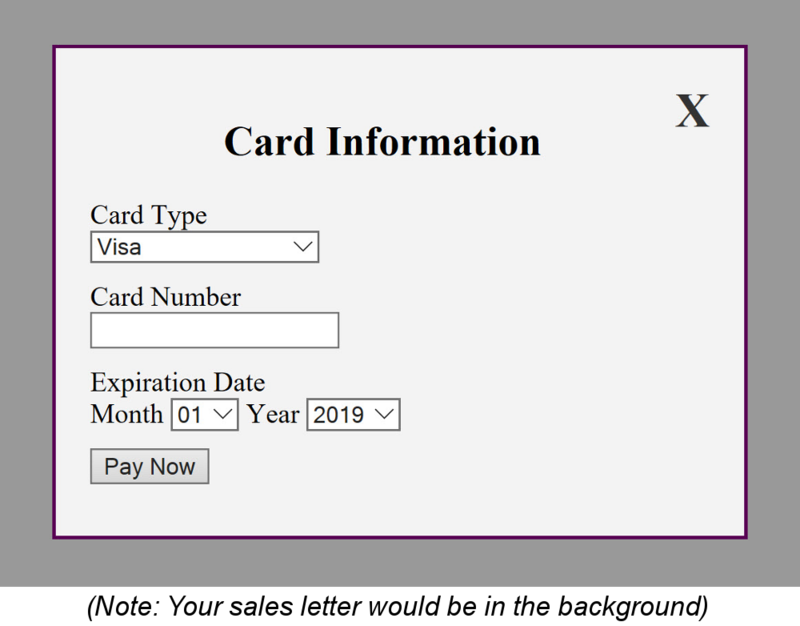 Not only is the billing information used to authenticate the credit card used but also gives the vendor very usefull information on their customers. If you have physical products that need to be shipped, DUvisioPay Embedded Payments can collect the shipping address if different from the Billing address. 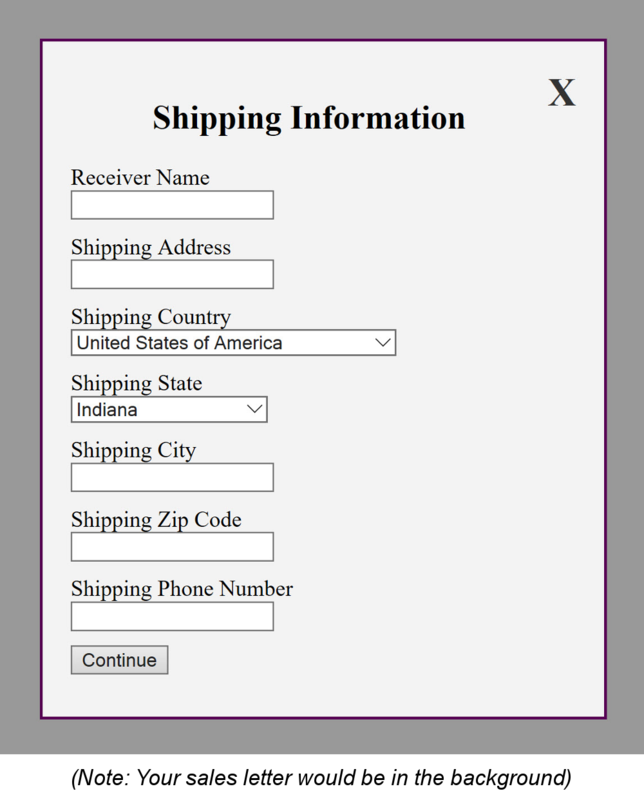 The customer has the ability to check a box so the shipping form does not appear. All other affiliate/vendor platforms do everything they can to brand themselves when you make sales of your products. With DUvisio's Embedded Payments the customer will only see your branding! 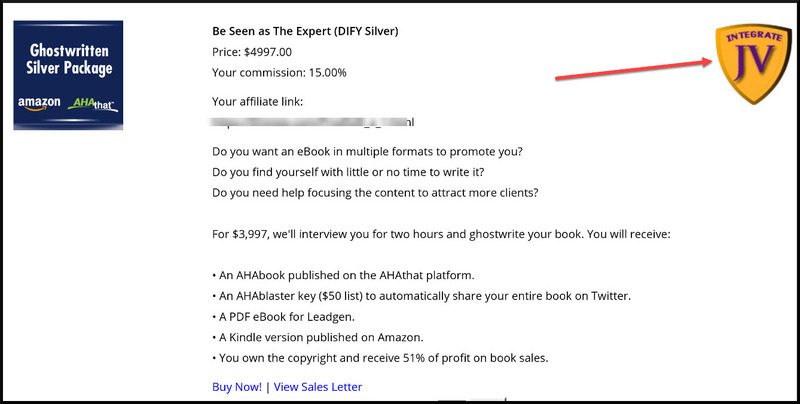 In all the images above your sales letter will be seen in the background and the entire process appears to take place on your website just like the big companies do it. Your company is listed on the thank you page. When the "Continue" button is clicked your customer is taken to any page on your website that you want... It could be your download page, a registration page or even even an upsell product. You can increase your profits, plus pay your affiliates and partners INSTANTLY at the point of sale! Mobile sales are increasing every day. 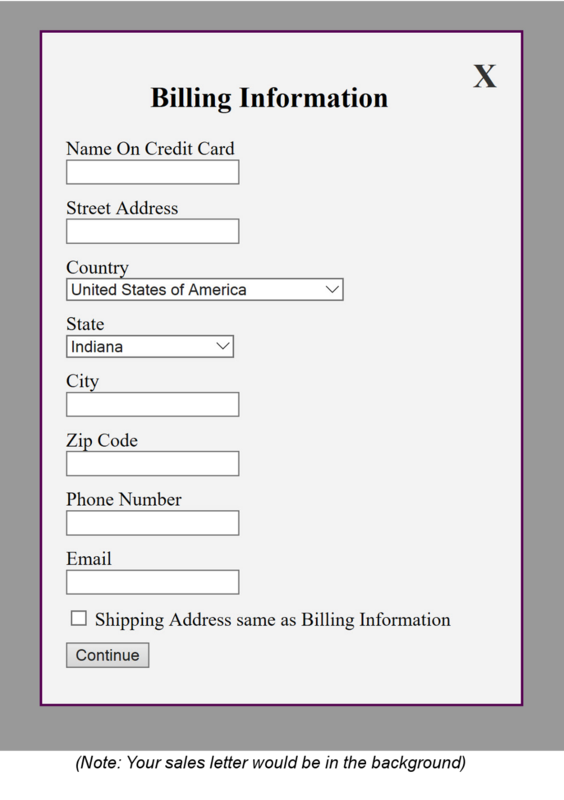 How many customers will you lose if your site is mobile friendly but the checkout process is not? Introducing DUvisio Mobile Embedded Payments! When your sales letter is viewed on a mobile phone, the Mobile Embedded Payments will automatically embed in your sales letter making the payment process extremely easy and quick to do on a mobile phone. Again paying your affiliates and partners INSTANTLY at the point of sale. Mobile Embedded Payments will be included automatically at no extra charge when you use DUvisio's Embedded Payments. What the heck is an "InstaJV Funnel System"? When you include your product in the DUvisio Public Marketplace you have the option of including the "Integrate JV" badge on it. This alerts other Sellers that you're open to a Joint Venture that would include your product in their funnel! This is the most powerful Joint Venture there is called Integration Marketing. This also alerts other sellers that you are open to other types of Joint Ventures. In an Affiliate Network like DUvisio, the way that Affiliates find your products to promote them is by your listing them in the Network's Marketplace. DUvisio works the same way. The "Integrate JV" badge is clickable by the other Seller. It opens a page where they'll be able to get your name and email address to contact you OR they can choose to get the assistance of DUvisio's Team of Certified JV Brokers*! Our Certified JV Brokers will then work with you and the other Seller to figure out the most strategic approach to the funnel and guide you to setting everything up! In the setup process, you and the other Seller will work together to have the front end product tied to the next product in the funnel as a "child product" so that the customer experiences a smooth flow from one Seller to the next! Affiliates promoting the funnel will be able to be paid INSTANTLY on every product in the funnel, helping to maximize the promotional power behind your campaign! If you've never had experience with this type of Integration Marketing, don't worry, you'll find training to help you every step of the way inside the Seller's Member's Area! * Certified JV Brokers receive 10% of all sales for this type of consultation. You can also get the help of the Certified JV Brokers to reach more Affiliates and JV Partners to increase the sales even further! Only at DUvisio... "Your Own PRIVATE Marketplace!" At DUviaio you can have your own PRIVATE Marketplace that spotlights only YOUR products from your entire product line! With your own PRIVATE Marketplace, you'll be able to choose whether you want your products listed in ONLY your Private Marketplace, or in both the Public and Your Private Marketplace. 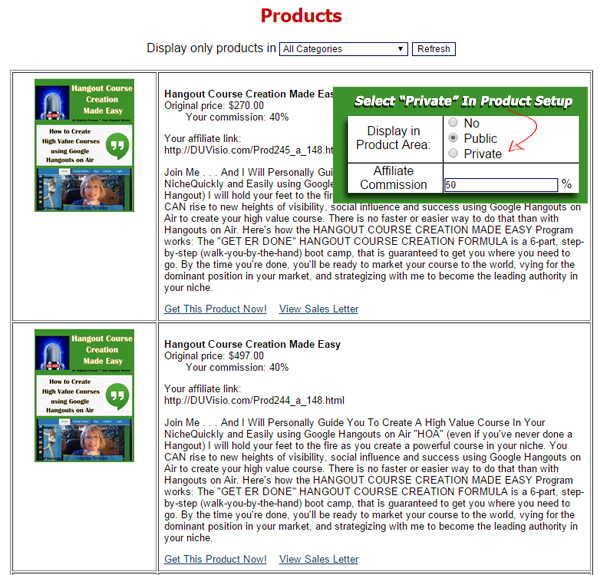 you'll have an entire PRIVATE Marketplace showcasing just YOUR products that you can use in your marketing campaigns! You can also create up to 5 Custom Marketplaces that contain ANY products you want from DUvisio, complete with your Affiliate Links embedded in each one! On other Affiliate/Vendor Platforms, you have 2 choices: put your products in the public marketplace so that prospective affiliates (including fraudulent affiliates) can find them to promote, or don't have them listed in a marketplace at all. But that means that you wouldn't ever want to send your prospects and customers to the marketplace to find your products. They'd be distracted by all the other "shiny objects" that they could buy (including your competitors products - possibly listed right next to your own!). With Your DUvisio Elite Membership, you'll be able to use your PRIVATE Marketplace in your marketing campaigns so you can get customers to buy again and again and even encourage affiliates to promote regularly! Sending weekly emails to your Affiliates with a link to your PRIVATE Marketplace (so they can find a product to promote that week! For your Private Marketplace and all 5 Custom Marketplaces, youâ€™ll have an RSS Feed that can allow you to pull the Marketplace into your website, into your Facebook page, submit the RSS Feed to RSS Directories and more! Take Members to your Private Marketplace when they logout of your Memberâ€™s Area to encourage repeat purchases! Send Affiliates to your PRIVATE Marketplace to find more products to promote! With your own PRIVATE Marketplace on DUvisio, you'll really set your business apart from the crowd and show the world that you're a force to be reckoned with! Did You Know DUvisio Practically Eliminates All Affiliate and Vendor Fraud! Unequalled Fraud Prevention - Other platforms let the affiliates and vendors to fend for themselves with no fraud protection. 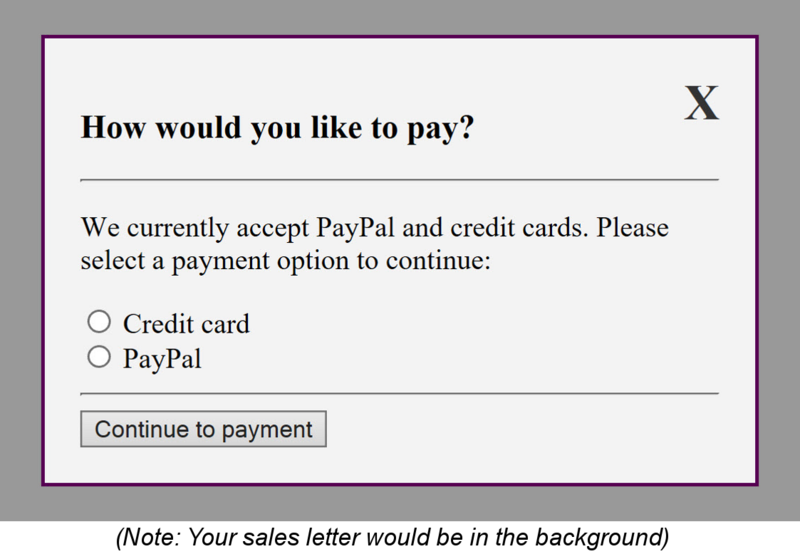 Vendors don't have to approve affiliates as the DUvisio software uses PayPal's security to approve only trust worthy affiliates. So PayPal determines which affiliates will receive instant payments. Affiliates are paid by PayPal removing payment responsibilities from Vendors guaranteeing all Affiliates are paid when promised. "Just How Does DUvisio Protect You From Vendor and Affiliate Fraud?" All other platforms require the vendors to approve affiliates and which ones would receive instant commission payments. Vendors don't have to worry about approving any affiliates because DUvisio has removed all affiliate fraud because PayPal determines which Affiliates will receive Instant commission payments. Vendors don't do any affiliate approval at DUvisio. Only affiliates who have a verified PayPal account can receive instant commission payments. All affiliates with a non-verified PayPal account can only receive delayed commission payments. All delayed affiliate commission payments are paid automatically from the vendor's PayPal account 30 days after the sale is made. If a vendor's PayPal account does not have enough money to pay an affiliate commission, PayPal will take the money from the vendor's bank account or credit card, which the vendor has approved as their back up funds and pays the affiliate commission. This guarantees that all affiliates with delayed commissions will be paid. The only time a delayed commission is not paid is when a customer has received a refund. When a customer pays with a credit or debit card, all affiliate commissions are paid instantly into the affiliate's DUvisioPay account and transfered directly into the affiliate's bank account 30 days after the date of the sale unless a refund has taken place. So, affiliates are not paid by the vendors, but by PayPal or DUvisioPay. DUvisio saves the vendors time and worry since affiliates don't need to be approved and DUvisio directs the payments of all affiliates for the vendors. Vendors don't have the ability to prevent paying an affiliate that has earned a commission. All vendors at DUvisio.com have Verified PayPal Business Accounts, even if they are just using DUvisioPay. If a vendor's PayPal account does not have enough money to pay an affiliate commission, PayPal will take the money from the vendor's bank account or credit card, which the vendor has approved as their back up funds and pays the affiliate commission. When DUvisioPay is used by a vendor the affiliate's commissions are separated from the vendor's DUvisioPay account instantly at the point of sale and deposited into the affiliate's DUvisioPay account Then paid to the affiliate's bank account 30 days after the date of the sale. Get More Sales Using DUvisio's Extremely flexible Coupons! Give Special Groups A Discount! 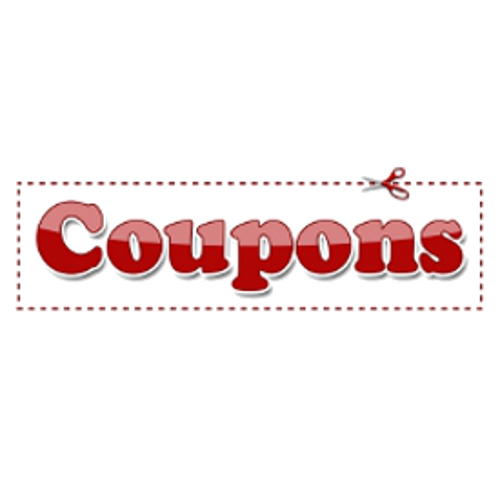 Vendors are able to create a unique coupon code that can be given out to special people or groups that will provide a special discount on their purchase. The coupon can lower a default price, add a trial period, make a subscription trial period longer or change the amounts due on a subscription. This coupon code is applied to the order page and the customer will see the changes the coupon code provides. 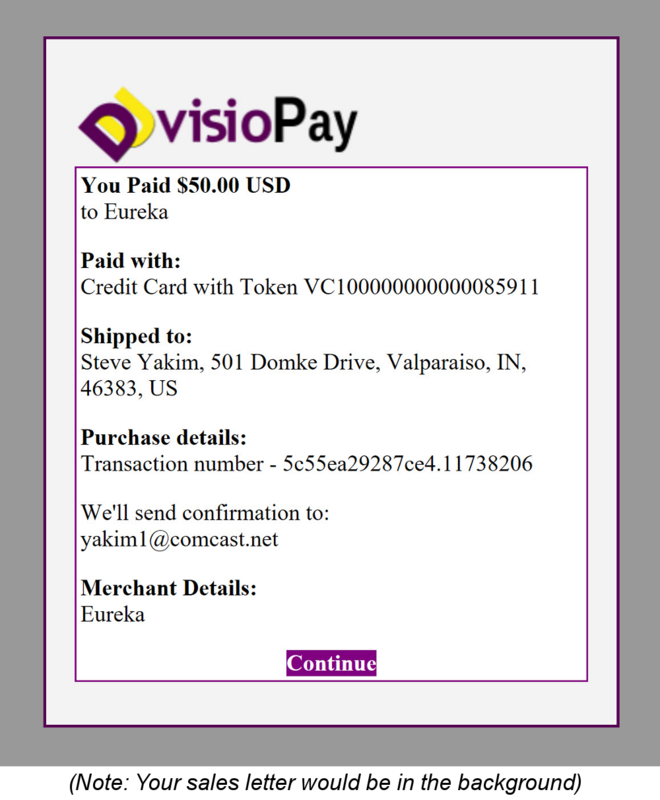 Coupons Can NOT be used with DUvisioPay Embedded Payments. Life Time Last Affiliate Cookies! When you promote a vendor's product, you are automatically cookied for all products at DUvisio.com. Not just for a specific vendor. If a customer purchases another vendor's product and you are cookied to that customer, you will receive a commission payment. You will automatically be paid a commission for upsells and downsells unless the vendor is not paying any commission on these products. 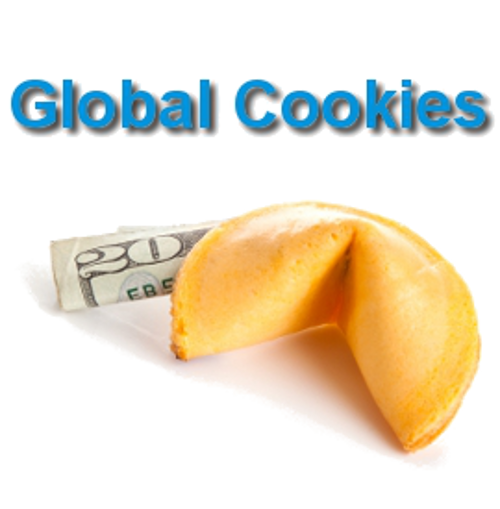 Your cookie will continue to earn commissions until it is overwritten by another affiliate cookie.